This title is directed primarily towards health care professionals outside of the United States. In today's mental health services, there is a pressing need for practitioners to place greater emphasis on working with users of services and to use skills that have a sound theoretical basis. This book focuses on evidence-based practice but reflects that, in mental health, the best evidence is the personal experience of the user. Many publications explore theoretical aspects of service delivery or provide an in-depth analysis of specific clinical interventions. However, how practitioners comprehensively amalgamate theory with their practice is often missing. This book fills that gap and seeks to guide, plan and suggest down-to-earth treatment ideas for individuals on a day-to-day basis. Contributors. Introduction. 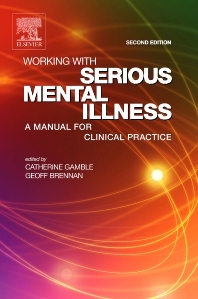 Section 1 - Promoting Understanding of the Manifestations of Serious Mental Illness. 1. Serious Mental Illness: A View from Within. 2. Inside Caring in Mental Health (Lyn Shore). 3. Social Inclusion (Rachel Perkins and Liz Sayce). 4. Stress Vulnerability Model of Serious Mental Illness (Geoff Brennan). 5. An Introduction to and Rationale for Psychosocial Interventions (Helen Healy, David Reader andKenny Midence). Section 2 - Engaging, Assessing and Formulating Care. 6. Building Relationships: Lessons to be Learnt (Catherine Gamble). 7. Severe Mental Illness: Symptoms, Signs and Diagnosis (Tom KJ Craig). 8. Assessments: a Rationalr for Choosing and Using (Catherine Gamble and Geoff Brennan). 9. Consolidating the Assessment Process (Catherine Gamble, Jayne Fox and Paddy Conroy). 10. Assessing Risk (Nigel Wellman). section 3 - Interventions. 11. Dealing with Voices and Strange Thoughts (Jem Mills). 12. Dealing with Blankness and Deadness (Jem Mills, Sue Kerr and sally Goldspink). 13. Working with Families and Informal Carers (Catherine Gamble and Geoff Brennan). 14. Co-existent Substance Use and Pschiatric Disorders (Jood Gibbins and Cheryl Kipping). 15. Working with People with Serious Metal Illness who are Angry (Paul Rogers and Andrew Vidgen). 16. Working with People with Serious Mental Illness at Risk of Offending (Paul Rogers and Andrew Vidgen). 17. Managing Medication (Jacqueline Sin and Cliff Roberts). 18. Cultural Issues (Avie Luthra and Dinesh Bhugra). Section 4 - Considerations for Effective Practice. 19. Ethical Considerations (Paula Morrison). 20. The Tip of the Iceberg (sharon Dennis). 21. Clinical support (Geoff Brennan and Catherine Gamble). Index.